Biography: In 1984, Dollar received a Bachelor of Science degree in education from West Georgia College in Carrollton, Georgia. He was awarded an honorary Doctor of Divinity from Oral Roberts University in 1998. Dollar claims to have received the vision for World Changers Ministries Christian Center in 1986. He held the church’s first worship service in the cafeteria of Kathleen Mitchell Elementary School in College Park, Georgia, with only eight people in attendance and successfully receiving over $100 in contributions from those present. Over the years the ministry has grown rapidly and was renamed World Changers Church International (WCCI). As of 2007, the congregation has grown to 30,000 members with $69 million in revenue (gross cash collections) for 2006. The congregation moved from its original cafeteria location to a modest-sized chapel, adding a weekly radio broadcast and four services each Sunday. On December 24, 1995, WCCI moved into its present location, the 8,500-seat sanctuary known as the World Dome. At a cost of nearly $18 million, it is claimed that the World Dome was built without any bank financing. Dollar is also the publisher of CHANGE magazine, a quarterly international publication with nearly 100,000 subscribers and The Max, a bimonthly resource newsletter for ministers and ministry leaders. 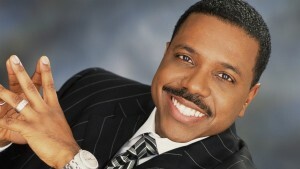 Creflo Dollar also frequently speaks at conferences and is a best selling author. Dollar and his wife, Taffi, have five children and live in Atlanta. This entry was posted in Sermons and tagged Clean Living by God's Power, Pastor Creflo Dollar, sermon by admin. Bookmark the permalink.